There’s a Royal Rendezvous on the horizon, and it’s happening on this side of the pond. 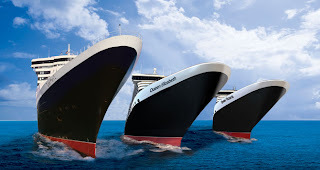 The newest addition to the trio of Cunard Royal cruise ships, the Queen Elizabeth, will arrive at Pier 88 on her maiden journey to NYC and meet up with the Queen Victoria and the Queen Mary II at the Statue of Liberty. Catch a “world class” Grucci fireworks display from Battery Park, the Esplanade of Battery Park City, Robert F. Wagner, Jr. Park and Hudson River Park... or board early on a New York Water Taxi ($65) for an intimate show.